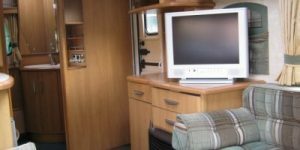 We know important it is to take your home comforts with you, and TV in your caravan is one of the most important. Here we cover some of the basic things that need to be considered when choosing the right TV service for you. Many people like the luxury of TV while away caravanning but choosing the right service doesn’t have to be complicated. Freeview will be the default free TV service that is replacing analogue by 2012. A Freeview digibox offers up to 50 channels, including a number of radio stations. There aren’t as many viewing options as other digital services, although there are a few extra subscription channels available at a small cost. Available in most supermarkets and on high streets, the initial investment for the Freeview box is the only cost you need to start using Freeview. Freeview boxes do require retuning from time to time, as the available channels are updated. If the digital signal is poor in your area there’s not much you can do until analogue is completely phased out and digital services are improved. However, the digital switchover should be complete by the end of 2012. Many modern TVs, as well as being remarkably light and compact, come with inbuilt Freeview receivers. If you are looking to upgrade from your old analogue set up this could be the best alternative. It is possible to pick up free to air channels using a portable caravan satellite connected to your TV. A wide range of channels, including local broadcasts, are transmitted from the satellite Astra 28 E. Signal strength is strong all across the UK and there should be no need for retuning. Freesat is a service provided by the BBC and ITV. If you have an existing SKY dish installation you will only need to buy the digibox to get started. The equipment varies in price, from the basic digibox to one with a built in hard drive to record all your favourite channels. Freesat offers a range of around 200 channels but you should look into them and see how many you would realistically watch to see whether you think it’s worth the cost of equipment. It’s also well worth reading the terms and conditions as the service is subject to change and you could end up incurring extra charges. A pricier option compared to the others but with the cost comes a much larger range of channels (depending on your subscription). This requires purchasing a Sky digibox, a viewing card from Sky and a satellite dish, if you haven’t already got one. It is important to remember there is no such thing as a digital aerial or antenna, they work for both analogue and digital. Some of the popular flying saucer aerials require little set up but do not receive as strong a signal as directional ones. Either way they are generally not as reliable as caravan satellites and may lose signal altogether in rural areas. As always, shop around and read reviews of the different services so you can choose what’s right for you.